In the first case under the newly-enforced Domestic Violence law in the country, a government employee was today arrested for allegedly torturing his wife at Melapalayam near here. He was booked under the Domestic Violence Act, 2005, which was notified for implementation only a couple of days ago and provides for stiff punishment for husbands and live-in partners who harass their wives and companions. Will making Barnala a new district help the people? India suffered a big blow ahead of the crucial Champions Trophy match against Australia tomorrow when Yuvraj Singh injured his left knee today while warming up with the team at the PCA Stadium at Mohali. Instead of granting financial relief or a package to Punjab, the Union Government has given it shock treatment which officials of the PSEB describe as discrimination in the allocation of power from the Central pool for the winter season. India today successfully carried out the first test of a cryogenic rocket engine at Mahendragiri in Tamil Nadu, putting the country in a select club of nations possessing such a capability. Mr Bhupinder Singh Thind, ADGP (Law and Order), Himachal Pradesh Police, was remanded in judicial custody till November 11 by Ms Harinder Sidhu, Special Magistrate, CBI, when he was produced in her court by a team of the CBI led by SP Mahesh Aggarwal here today. Four persons were killed and 42 injured, six of them seriously, in a huge pile up of five vehicles at Ludhiana-Jagraon road near Baddowal early morning today. Tied down by the "Cigarettes and other Tobacco Products Act 2003" (COTP) which prohibits the promotion of tobacco in all forms, firms have devised a new way to advertise their products. 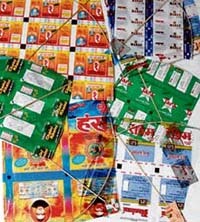 Kites inscribed with advertisements of chewing tobacco firms like Hans Chhap Khaini and Rashmi Zarda. — Tribune photo byManoj Mahajan.